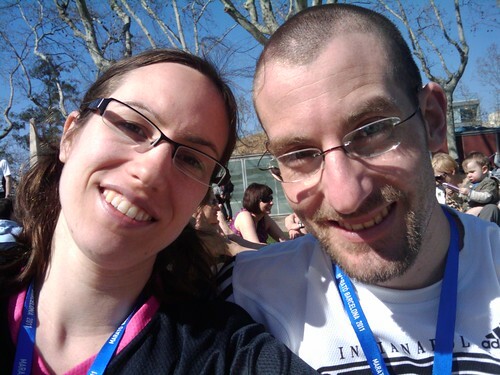 TL; DR: I ran a marathon in Barcelona! It was awesome. On Sunday, Alex oniugnip, Graham cola_fan, Xana, and I set out from Graham and Xana's apartment at around 7:30 in the morning and headed toward Plaça Espanya on the metro. It wasn't very crowded, but there were a few people wearing running clothes and tell-tale timing chips, and the train filled up with more and more of them as we got closer to our destination. By the time we got to Plaça Espanya about half an hour before the race was to start, we were surrounded by a huge crush of runners and spectators. The weather was beautiful, so we all peeled off a layer of clothing and gave it to Xana, who wouldn't be running. I parted ways with everyone and went off in search of the 4:30 pace group, which turned out to be a group of three or four guys with helium balloons reading "4h30m" tied to their backs. (The balloon thing was clever; in some races I've been in, the pace groups have had to carry signs.) The race started, and I was off!...to a slow shuffle, since there were about 15,000 runners, and roughly 13,000 of them were in front of me. The clock was already at 11 minutes or so when I crossed the starting line. Fortunately, that's what timing chips are for -- they make it possible for one's start time to be calculated based on, you know, when one actually crosses the starting line as opposed to when the gun goes off. At the midpoint of the race, I realized that I wasn't getting out in front of the 4:30 group nearly as readily as I had been early on. I decided to take that as a cue to change my strategy from "don't go out too fast" to "don't save too much for the end". So, around mile 15, I began a cycle of picking someone out, catching him or her, then choosing my next victim and repeating. Going into mile 18, I was in much better shape than I had been at that point in the race in 2009. I attribute this partly to not having gone out too fast and partly to the fact that I had slathered my feet in lubricant before the race. The painful blisters I had gotten in 2009 were a non-issue this time. I was still in pain, you understand, but it was great to have it be mere musculoskeletal pain, rather than blister pain. 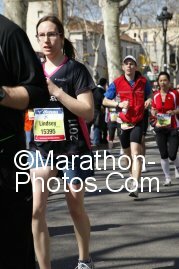 At mile 22, we ran under the Arc de Triomf. Lots of my fellow runners were hurting at this point; all around me, people were stopping to walk. 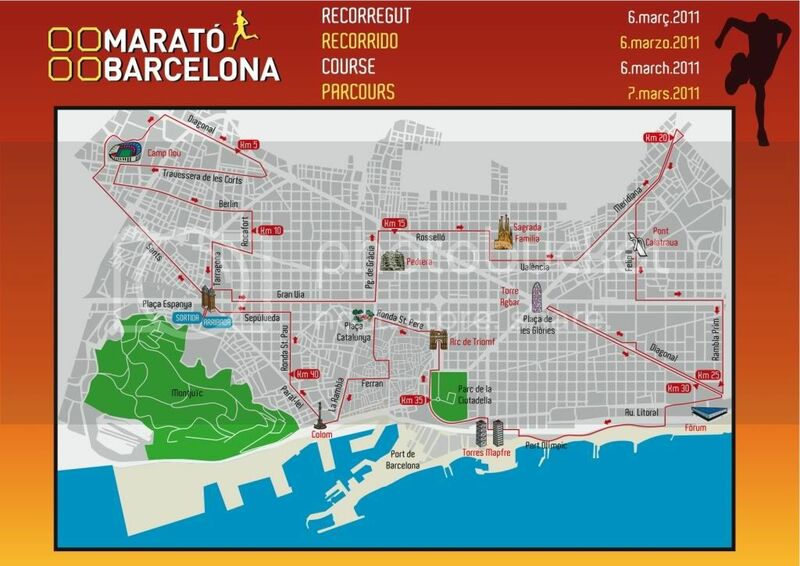 I was hurting a lot, too, but there was no way that I was going to have come all the way to Barcelona, run a marathon, and then not run under the frickin' Arc de Triomf. So I ran, yelling "Wooooooooo! ", with my arms raised over my head, and got a nice cheer out of the spectators. (One great thing about running marathons is that complete strangers cheer for you. Some people glanced at my name and opted to yell "Go, Lindsey! ", but of course I also got plenty of "¡Vinga, vinga, vinga!3 ¡Vamos, vamos! ¡Ánimo, ánimo!" I got tons of high fives, too, especially from little kids; I have now high-fived many small Catalonian hands.) The only problem was that just prior to the Arc de Triomf, there had been an aid station where they were giving out bananas, so there were banana peels littered all over the road, and I slipped on one! I didn't actually fall, though, just skidded on one foot briefly. It was more hilarious than dangerous. With only a couple of kilometers left to go, the 4:30 pace group caught up with and passed me. At that point, I think the climbing I've been doing helped. At the risk of sounding trite, I can say that for me, learning to climb has been about attempting to do things that seem impossible and finding that sometimes they're actually possible, and having had that experience helped me finish the race well. I didn't quite catch the 4:30 group, but I was able to close much of the gap -- and then, it turned out that they were running a bit ahead of schedule, so even though I crossed the finish line after the 4h30m balloon guys, I still made my goal of finishing in under 4:30! My final time was 4:29:16, beating my previous personal record by more than 10 minutes. This cheesy auto-generated infographic of my race results shows that I did a decent job of planning the race; my second half was only about a minute slower than my first half, meaning that I went out neither too fast nor too slowly. 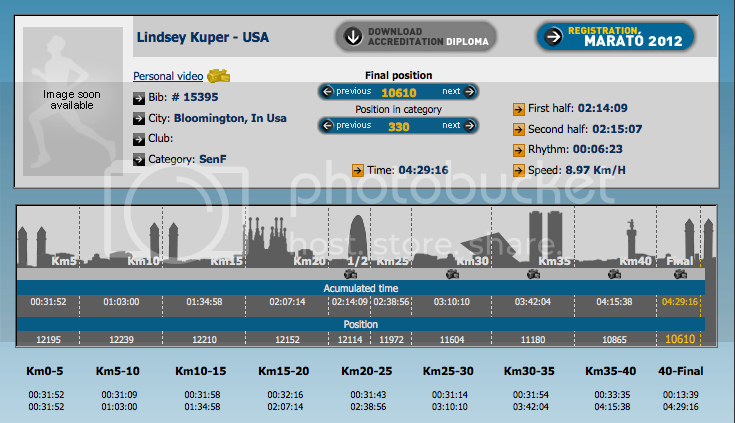 The "position" results also show that I was passing people for most of the race. Woohoo! When I got out of the finishing area, Xana, Graham, and Alex were waiting for me on the steps of the art museum, along with Xana and Graham's friends Javi and Anna who had come to cheer us on. We all proceeded -- very slowly and stiffly -- up the steps to an outdoor cafe next to the museum, where we got water and snacks and flopped down on a lawn so green and well-manicured that at first Graham didn't believe it was real grass. We were still only a little way away from the finish line, and I couldn't help thinking that if we had been in the States, any grassy area this close to the finish line of a race with 15,000 runners would have been churned into mud by runners and spectators within seconds. Instead, it was idyllic and peaceful, and we lay there on the grass for a long time, giving each other leg rubs. Eventually, Alex, Graham, Xana, and I headed back to the apartment, washed up, and went out for enormous plates of falafel at a place within hobbling distance and then to a cafe for thick, rich Spanish hot chocolate. We rendezvoused with Javi and Anna there, and had a conversation that alternated between Spanish and English; I didn't understand a lot of it, but was able to catch things here and there. ("Om nom nom", it turns out, is universal.) We headed home and napped for a few hours, then made even more falafel and stayed up late talking and eating. We finally collapsed into bed at two in the morning, sore and happy. Graham claimed to have been the model for it. The Catalan equivalent of "venga" -- roughly, "C'mon!" I only read the first volume so far, but oh, man, "Half a Life" in particular was pretty great. Alex kept trying to read it over my shoulder, so that counts as a stamp of approval from him, too. I'm leaving again on Saturday! SO SOON AUGH. If you don't have plans Friday afternoon or evening, it'd be great to see you. I need to send a missive out to all the people I want to see before I go away.